"I just recently bought a Canon camcorder (HFM40) which takes the AVCHD files (.mt2s). I want to simple edit the AVCHD files such as cutting the parts that I don’t need. I tried to use VideoStudio X4 to edit them but found the output files are much worse than the source videos. I searched the web and found that Sony Vegas seems to be the only popular editor that can do the so called smart rendering if I am just doing simple cutting. However, after using Sony Vegas Premium 11, I found that the output videos’ quality is still not good enough. 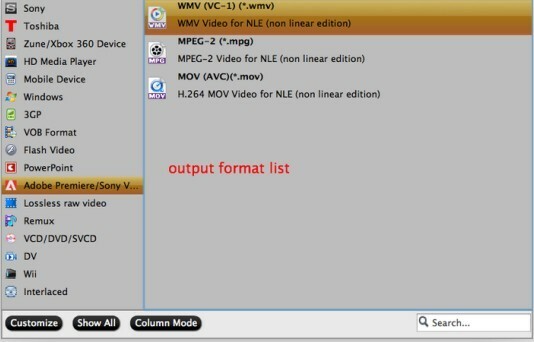 How to smart render AVCHD Videos with Sony Vegas? " To solve the problem, we have to know smart rendering first. "Utilize SMART RENDER technology for faster encoding of cuts-only projects, or projects with minimal changes. No generation loss occurs because video frames pass through the engine unaltered. When rendering to any of the following formats, unedited video frames are passed through without recompression (smart rendering): DV AVI, DV MXF, IMX MXF (IMX 24p MXF is not supported for smart rendering), HD MXF, MPEG-2 (for files such as those from HDV and DVD camcorders), XDCAM EX." So SMART RENDERING does not apply to AVCHD encoded files. There are no NLE apps out there that can do "smart rendering" of AVCHD encoded files. It is due to the compression complexity of the AVC codec. Now we know that smart rendering does not apply to AVCHD encoded files, so we need to convert AVCHD to a format that well applicable for smart rendering and Sony Vegas Premium 11, such as WMV. Aunsoft Panasonic AVCHD Converter for Mac is a good tool for transferring AVCHD to other formats including WMV. It is easy to use and transfer videos with minimal changes that you hardly see any difference with the source videos. Here's a quick guide for using Panasonic AVCHD Converter for Mac. You can clearly see the process from the below pictures. Tips: Click "settings" and you can do some setting with your personal preference such as size, bitrate, etc. If you want to join several fragments into one, click on "merge into one file". With Panasonic AVCHD Converter for Mac, you can freely transfer AVCHD format to other formats and use for editing software, of course it enables you to smart render AVCHD Videos with Sony Vegas.